The 2009 Mustang GT has the standard and premium option package. Both include the 4.6 liter, over-head cam, 3 valve, V8 engine; stainless steel dual exhaust; TR3650 5-speed manual transmission; fog lamps; rear spoiler; performance tires; and 17-inch painted cast aluminum wheels. The GT premium package comes with the Shaker 500 audio system, Satellite Radio, and an interior upgrade including a power adjustable leather sport bucket seats. Additional options include an automatic transmission, glass roof, tire and stereo upgrades, seat upgrades, premium 18-inch Aluminum wheels, HID headlamps, a GT security system, and a Bullitt package. Dark Candy Apple Red 2009 Mustang GT premium coupe with 18 inch polished aluminum wheels, rear spoiler delete, GT appearance package (hood scoop, bright rolled exhaust tips, and Pony emblem engine cover), fog lamps, and a 300hp 4.6L V8 engine. This is the higher of the two GT optioned 2009 Mustangs which comes standard with the fog lamp but not the hood scoop, rear spoiler delete option, or 18 inch aluminum wheels. The 2009 Mustang does although have a 45th anniversary emblem on it just behind the front wheel. Vista Blue 2009 Mustang GT convertible owned by Dave from Grayling, Michigan. Dave has added a Supercharger which brings it to about 540 horsepower. This was our featured Attitude Of The Week photo for the week starting 1-25-09. This photo looks like it's still on the dealership showroom floor! Vapor 2009 Mustang GT coupe with a bright set of 18-inch polished aluminum wheels. It has the GT Appearance Package which includes the hood scoop and chrome exhaust tips. Under the hood is a 4.6L V8 engine. Grabber Orange 2009 Mustang GT coupe owned by Michael Martin from Livingston, Texas. It has a 4.6L V8 engine and a manual transmission. Michael tells us more, "This is my second GT. I have a 2002 as well. I was in the market but not really looking for anything special until I ran across this one! The color and glass roof sold me right away. I have put in a few aftermarket items. It is a daily driver. I currently run at 2000 RPM and getting 31mpg but yet can keep up with the best of them. This is the best automobile investment I have ever made." Performance White 2009 Mustang GT California Special convertible owned by Annie Gagnon from Gatineau, Quebec, Canada. Annie tells us, "My nick name is 'Mustang Girl Annie'. I have a GT/CS with horse tattoo on my back and a Mustang horse and Mustang in script on my leg. My husband bought me my first stang in 2007 - a gorgeous 2000 LX convertible silver. That was her name too, for saying thank you for supporting him and my kids while he was in Afghanistan for 8 months. Oh my - it started a crazy passion, added parts, joined the Gatineau Mustang club, got the tats, and sold it in 2009 to realize my dream of buying a GT/CS. It happened on January 26 2009. It will be mine for ever. I just added a few interior chrome parts, a custom tonneau cover, and a Roush CAI. I'm thinking of having a custom 'support our troops' ribbon painted on my hood depending of the price. It would be my way of saying thank you to my husband and all the soldiers for what they do for our Country. Be safe and let's ride the pony :-) Mustang Girl Annie." Dark Candy Apple Red 2009 Mustang GT coupe owned by a site visitor from Evansville, Indiana. It has the 289ci 4.6L V8 engine and a manual transmission. Black 2009 Mustang GT/CS coupe with white side stripes and a black and camel colored interior. The California Special comes standard with the CS tape stripes on the doors, special Mustang floor mats, and 18-inch wheels and tires with the Pony center cap. This one also has the GT appearance package which includes the hood scoop, chrome exhaust tips, and a Pony emblem on the engine cover. 2009 Vapor GT California Special Mustang coupe with 18 inch bright polished aluminum wheels, fog lamps, a lowered (by 1.5 inches) front chin spoiler, hood scoop, rear spoiler, black side GT/CS stripes, side scoop, special GT/CS interior and the GT 4.6 liter V8 engine. 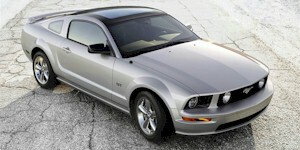 Brilliant Silver 2009 Mustang GT coupe with the awesome Glass Roof option. The actual roof is installed at Ford's vehicle personalization facility which is next to their Automotive Alliance International plant in Flat Rock, Michigan. These are Ford promotional photos. Grabber Orange 2009 Mustang GT with dealer installed parts turning it into a Mach-1 clone. These parts include a Mach 1 graphics package, Shaker hood scoop, flat black hood accent stripe, 20 inch staggered Shelby Wheels, matte black rear spoiler, flat black front chin spoiler, honeycomb trunk insert, Flowmaster axleback mufflers, GT side scoops, flush rear quarter window louvers, Ford GT engine start button, Hurst short throw shifter, and tinted windows. Close-up of a Ford promotional photo of a Performance White 2009 Mustang GT California Special in the sunset. The GTCS is only available for the GT premium V8 Mustang in Vista Blue, Performance White, Dark Candy Apple Red, Black, or Vapor Silver. It includes black with dove or black with parchment interior accented environments, black leather trimmed seats with unique California Special dove or parchment "GT leather" inserts, bright rolled exhaust tips, carpeted front floor mats with unique brushed chrome "Mustang" badge, 18 inch polished aluminum wheels, side scopes, unique front and rear fascia, and unique tape stripes in black or white. This Torch Red 2009 Mustang GT California Special coupe with glass roof was at the 2010 Mustang car show in Port Angeles, Washington.